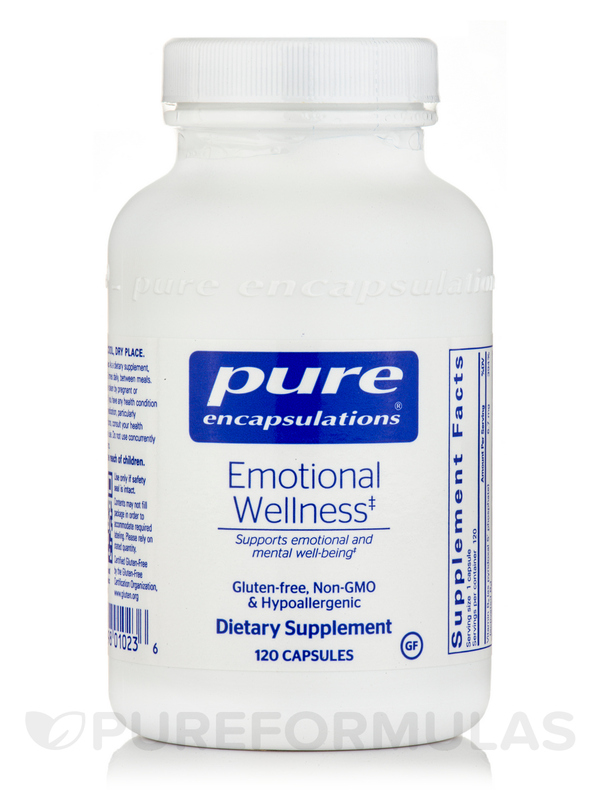 Pure Encapsulations’ Emotional Wellness is a good source of the inhibitory neurotransmitter GABA (gamma-aminobutyric acid)‚ which may work to promote a feeling of relaxation. 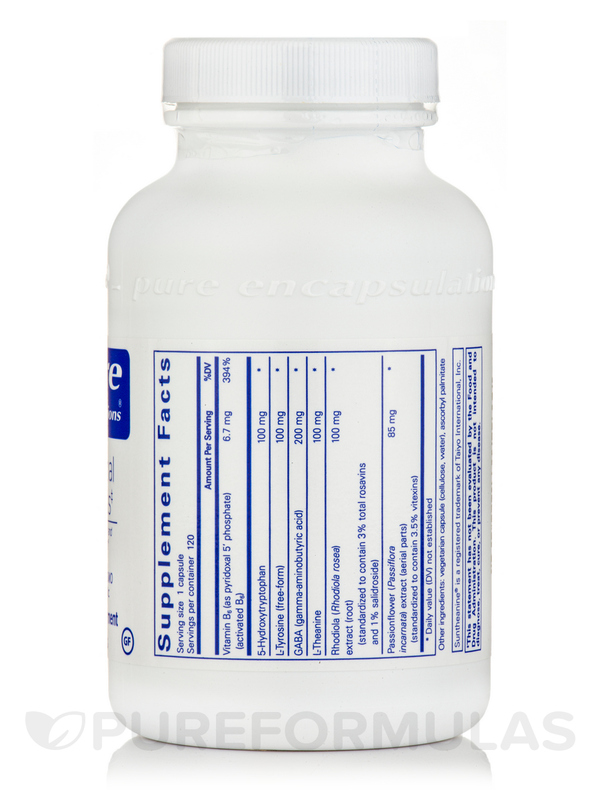 This supplement also contains L-theanine‚ an amino acid that might offer further support for enhanced alpha wave production. 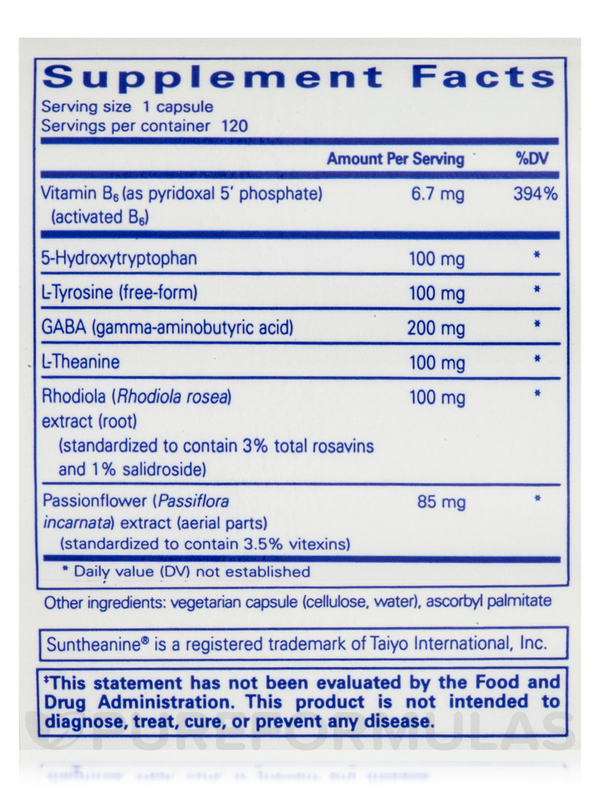 5-hydroxytryptophan (5-HTP) is a chemical found in every capsule of Emotional Wellness. 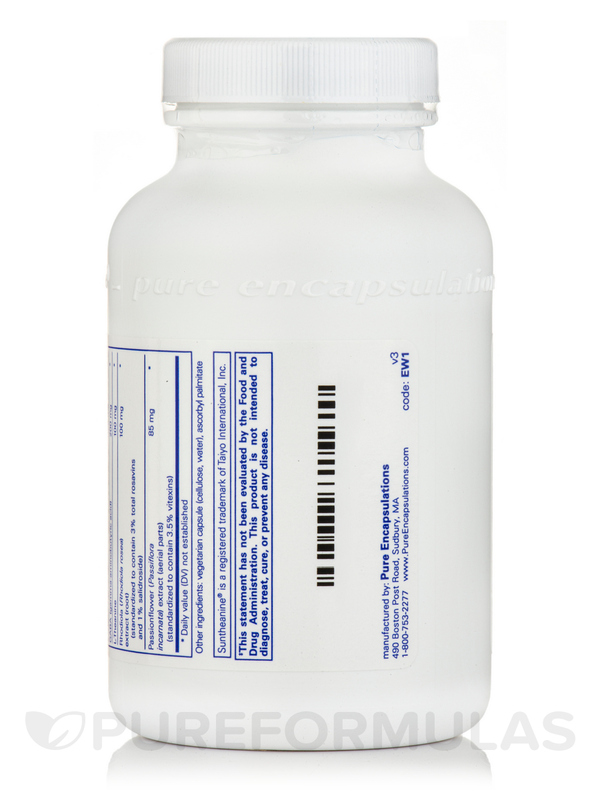 5-HTP serves as a precursor for other neurotransmitters in the brain. Neurotransmitters such as epinephrine‚ norepinephrine‚ dopamine‚ and serotonin can potentially contribute to a healthy mood; they may also play roles in regulating sleep/wake cycles and endocrine activity. Meanwhile‚ the amino acid L-tyrosine may work to support memory and cognitive function during occasional periods of stress‚ while vitamin B6 could help maintain normal nerve function. Emotional Wellness also contains natural passion flower and rhodiola rosea extracts‚ since these herbs may help address certain symptoms associated with mild anxiety or nervousness. Take one to three capsules a day between meals. 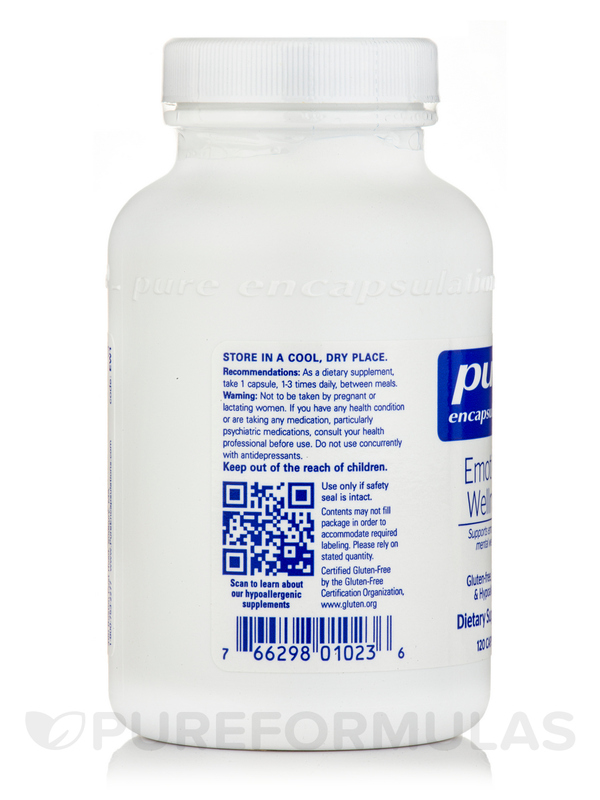 At the recommended dosage‚ each 120-capsule bottle of Emotional Wellness by Pure Encapsulations should last from 40 days to about four months. Store sealed in a cool‚ dry area. Tamper resistant. 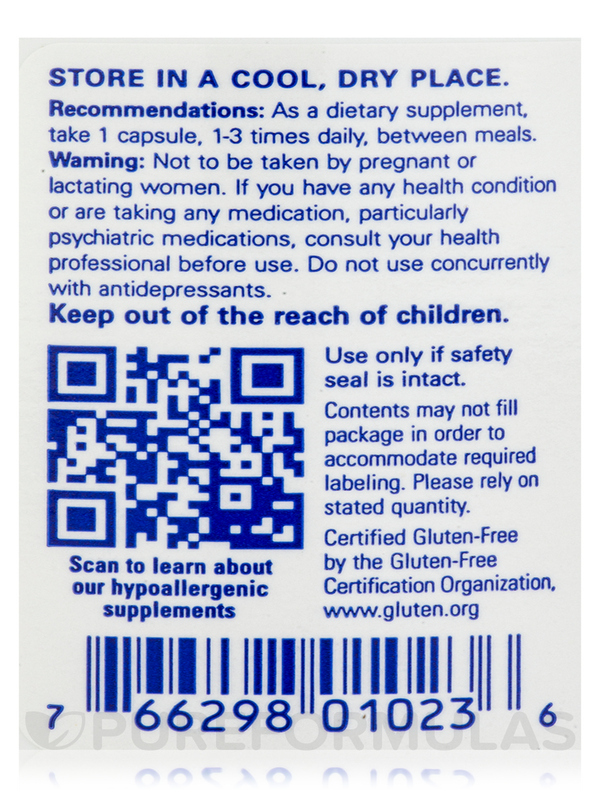 Use only if safety seal is intact. Not to be taken by pregnant or lactating women. Do not use concurrently with SSRI medications or MAO inhibitors. Keep out of the reach of children. On the recommendation of my doctor (doctor of osteopathy) I began using Emotional Wellness 6 weeks ago. My main challenge is severe adrenal fatigue; I also have high glucose and high calcium. My doctor has added several supplements that Im using daily. I imagine all of these contribute to the gradual improvements Im feeling with my health. My 8 year old son has been on Emotional Wellness by Pure Encapsulations for 6 months now and it has helped him tremendously! The most significant difference is the reduction in impulsive behaviours (like antagonizing his sister). :) I'm so thankful for it!